Contact Travis@RichardsonSoils.com about open seats or to be notified about the next class. This is a comprehensive 2-day course focusing on all parameters of the state wetland and surface water delineation methodology. Participants will be taught criteria listed in Ch 62-340 Florida Administrative Code to accurately define and defend their wetland delineations. 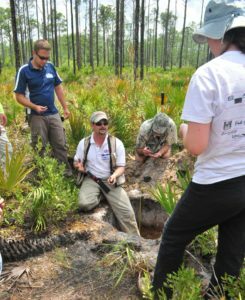 Hydric soils, common wetland and transitional vegetation, and hydrologic indicators will be taught in the classroom and reinforced during field exercises. Participants will be required to work through the state wetland data form and adequately document field sites. Following this workshop participants are expected to have the skills to delineate up to moderately difficult wetlands. Approved for 1.06 equivalent semester hours for PWS.